Injured By A Dog Bite In A Wisconsin Business | Hupy and Abraham, S.C. While most Wisconsin businesses do not allow dogs, some businesses do. Pet stores, veterinarians’ offices, and other places that want to attract pet owners may allow domestic animals in their places of business. Unfortunately, dog bites can happen anywhere—including in retail and office locations. But Who is Responsible If the Dog Bites? A dog is not kept on a leash. An aggressive dog is brought into a store. The design of the store does not allow enough space for customers to walk past aggressive animals. A store owner fails to remove an aggressive animal. In Wisconsin, a dog owner is usually liable for any injuries caused by his dog. If the dog that bit you belongs to the business owner, then the business will be liable for the dog bite. If a customer owns the dog, that customer will be liable for your injuries. However, in this case, the business may also be held partially accountable if it can be shown that the business owner was negligent in providing adequate safety precautions against dog attacks. If a store allows animals, it is the store owner’s responsibility to provide a safe environment for all patrons. Rules should be posted warning of the presence of pets and asking pet owners to follow safety guidelines and properly restrain their pets at all times. What kind of store was it? You would expect dogs to be a danger in a pet store, but not in a grocery store, for example. Did the business owner make it a policy to allow pets in the store? If allowing pets is not a general policy, did the business owner know that the pet was in the store? Did the business owner ask the dog owner to remove his pet from the premises? Was there a reason to believe that the dog was dangerous? Were you in a restricted part of the store? And you should know what to do if you are hurt. Alert a store employee immediately. Ask the manager to call 911. Identify the dog. Ask the manager to get the dog owner’s name and contact information. The owner will be able to provide immunization records for the dog. Without these records, you may have to undergo painful rabies vaccination. 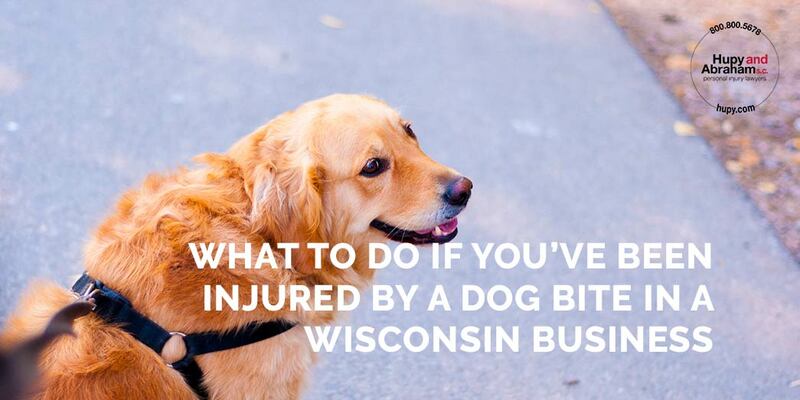 You will also need this information to file your Wisconsin dog bite claim. Get medical attention for your dog bite injuries. Follow your doctor’s instructions. Take pictures of your injuries. If you can, take pictures of the scene where the dog attack occurred. Report the dog attack to animal control. Do not give the insurance company any information about the attack or your injuries. Do not sign any papers. Save copies of all your medical bills and any paperwork related to your injuries. If you or your child has been attacked by another customer’s pet while shopping, you should also contact a dog bite lawyer immediately. Time is critical after a dog bite attack. Your Wisconsin dog bite claim must be filed within three years of the date of injury. However, the longer you wait, the more likely that evidence will be destroyed. Call us today at 1-800-800-5678 to learn more about your rights and potential recovery.